Product Development Workshop for youth and adults. Workshops For Youth and Adults By Gmoss Designs George uses his experience to mentor youth and young adults. His Product Development Workshop - "How to Develop your own line of Apparel, Art, and Accessories." He teaches attendees how they can create their own designs for small or mass production. George's goal is to encourage youth and young adults to work hard, use their talents, protect their creations, and to help their community. Teaching my Workshop at the Main Broward Library in Ft. Lauderdale. Sharing how we made my character costume design during one of my workshops. Teaching my Product Development Workshop to the Fashion Merchandising students at the Art Institute of Ft. Lauderdale. 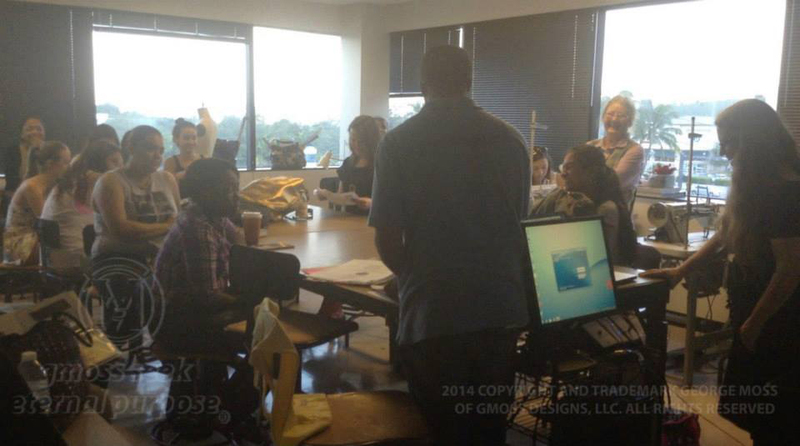 He shares with his attendees how to create their own designs from a concept sketch to small or mass production. He also shares the importance of protecting their designs. George’s goal is to encourage youth and young adults to work hard, use their talents, protect their creations, and to help their community. If you’re not able to attend his workshop, you can refer to the this link to download his workshop notes.